Dingell: “The bill is going to be a hard one for the industry to accept, but I believe it's in the public interest and is good overall." WASHINGTON -- A U.S. House committee today passed a sweeping auto-safety bill with a number of changes in the original legislation that had been sought by the auto industry and Rep. John Dingell, D-Mich. The new House Energy and Commerce Committee bill, which now goes to the floor of the House, would require installation of brake-override systems and event-data recorders, or black boxes, in the wake of Toyota's unintended acceleration problems. Regulators also would have to consider standards for foot-pedal placement, electronic systems, push-button ignition systems and transmission configuration. The bill leaves it to the National Highway Traffic Safety Administration to decide on the timetable for industry to carry out many of the requirements. The original legislation outlined a time frame that automakers said was burdensome. The committee also dropped a requirement that black boxes record crash data for 75 seconds, leaving it to NHTSA to decide on the technology provisions. In addition, the legislation would increase maximum fines on automakers for safety defects from $16.4 million to $200 million -- amending an earlier version of the bill that would have eliminated a cap on penalties. NHTSA also would receive increases in funding and an expansion of its authority, and auto-safety information would become more transparent to consumers. “The committee addressed a lot of our concerns,” said Michael Stanton, president of the Association of International Automobile Manufacturers. The panel divided strictly along party lines in a 31-21 vote. Stanton predicted that Congress would pass a bill by the fall and send it to President Barack Obama, who has endorsed the thrust of the legislation. The congressional push follows Toyota's worldwide recalls of 10.6 million vehicles since the fall for sudden acceleration. U.S. regulators are investigating reports of 89 deaths in the United States. Toyota already has paid a record fine of $16.4 million. A similar Senate bill has been introduced with at least one notable difference from the House measure: It would eliminate the cap on automaker fines. No dates have been set either for a vote by the Senate Commerce Committee or by the full House. The House measure would beef up NHTSA funding by phasing in fees on automakers of $9 a vehicle and by doubling federal funding to $280 million over three years. “This bill will dramatically improve the safety of motor vehicles,” said Rep. Henry Waxman, D-Calif., chairman of the energy and commerce panel. The Transportation Department also would have the authority to order recalls if it determines that there is an “imminent hazard” of public danger. But the agency would have to give notice to the manufacturer and offer the automaker the right to appeal. This appeal right, which was not in the original bill introduced by Waxman, had been sought by Dingell. 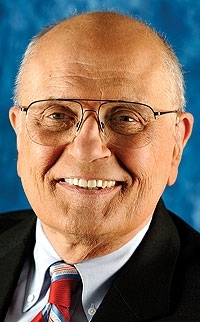 “The bill is going to be a hard one for the industry to accept, but I believe it's in the public interest and is good overall,” Dingell said. Although Waxman bowed to Dingell on a number of provisions, he got the committee to add a revolving-door restriction. It would impose a one-year prohibition on lobbying of NHTSA by former NHTSA officials who join the industry. The bill also contains a new requirement for an alert sound on electric or hybrid vehicles that allows detection by blind pedestrians. Although the auto lobby got many of the changes it sought, the new bill still left many Republicans dissatisfied. In a related development, Honda Motor Co. today formally announced plans to install brake-override technology in Honda and Acura models. "We are committed to applying brake priority logic on 100 percent of Honda and Acura passenger vehicles produced for the North American market by the end of calendar year 2011, with our first application coming to market in late August 2010," Honda said in a statement. A spokesman had outlined the initiative earlier this month.